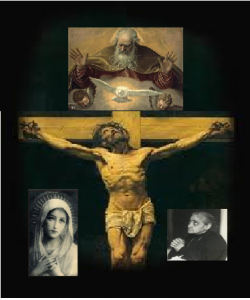 More ways to fuse oneself in the Divine Will, in order to give God, in the name of all, the requital of love and glory for the works of Creation, Redemption and Sanctification. After I had let the confessor hear what is written above, with the date of May 10th, he was not satisfied, and imposed on me to continue writing about the way I fuse myself in the Holy Divine Volition. So, only to obey, and for fear that my Jesus might be disappointed even slightly, I resume my speaking. Then, after this, I feel that my office is not complete, therefore I descend down below within that void, in order to requite Jesus for the work of Redemption. And as though finding all that He did in act, I want to give Him my requital of all the acts which all creatures should have done for Him, in awaiting Him and receiving Him upon earth. Then, as though wanting to transform all of myself into love for Jesus, I go back to my refrain, and I say: ‘I love You in your act of descending from Heaven; I impress my ‘I love You’ in your act of being conceived; ‘I love You’ in the first drop of blood which was formed in your Humanity; ‘I love You’ in the first beat of your Heart, so as to mark all your heartbeats with my ‘I love You’. ‘I love You’ in your first breath; ‘I love You’ in your first pains; ‘I love You’ in the first tears You shed in the maternal womb. I want to requite your prayers, your reparations, your offerings, with my ‘I love You’; I want to seal each instant of your life with my ‘I love You’. ‘I love You’ in your being born; ‘I love You’ in the cold You suffered; ‘I love You’ in each drop of the milk You suckled from your Mama. I intend to fill with my ‘I love You’s’ the clothes with which your Mama swaddled You; I lay my ‘I love You’ upon that ground on which your dear Mother laid You down gently in the manger, and your most tender limbs felt the hardness of the hay – but more than of hay, the hardness of hearts. My ‘I love You’ in each of your wailings, in all the tears and pains of your tender age. I make my ‘I love You’ flow within all the relations and communications and love You had with your Mama. ‘I love You’ in each word You spoke, in the food You took, in the steps You took, in the water You drank. ‘I love You’ in the work You did with your hands; ‘I love You’ in all the acts You did during your hidden life. I seal my ‘I love You’ in each one of your interior acts and in the pains You suffered; I lay my ‘I love You’ on the roads You covered, in the air You breathed, in all the sermons You gave during your public life. My ‘I love You’ flows in the power of the miracles You performed, in the Sacraments You instituted. In everything, O my Jesus, even in the inmost fibers of your Heart, I impress my ‘I love You’ for myself and for all. Your Will makes everything present to me, and nothing do I want to leave out, in which my ‘I love You’ is not impressed. Your little daughter of your Will feels the duty, if there is nothing else she can do for You, that You may have at least a little ‘I love You’ for everything You have done for me and for all! Therefore, my ‘I love You’ follows You in all the pains of your Passion, in all the spit, scorns and insults that they gave You. My ‘I love You’ seals each drop of the blood You shed, each blow You received, each wound that formed in your body, each thorn that pierced your head, the bitter pains of the crucifixion, the words You pronounced on the Cross. Up to your last breath, I intend to impress my ‘I love You’. I want to close all your life, all your acts, with my ‘I love You’. I want You to touch, see and feel my continuous ‘I love You’ everywhere. My ‘I love You’ will never leave You – your very Will is the life of my ‘I love You’. Now I believe that obedience will be content in some way, though it is true that in many things I had to make a few jumps, otherwise I would never end. Fusing myself in the Supreme Volition is like a springing fount for me; and every little thing I hear or see, one offense given to my Jesus, is an occasion for me for new ways and new fusions in His Most Holy Will.